The Yavapai County Courthouse in Prescott, Arizona has several Western-themed sculptures on the grounds. A couple of days ago I posted a shot of one of them, and today I’ve processed another one. This is the Buckey O’Neill Monument dedicated to the Rough Riders. Buckey O’Neill was the true archetype of the American cowboy. There’s a nice article about him on Wikipedia, where you’ll find, for instance, that he was played by Sam Elliot in the TNT movie Rough Riders. The statue is not Buckey, but Buckey was a member of the Rough Riders and was killed in action in 1898 in the war against the Spanish. Teddy Roosevelt wrote about the death of O’Neill: “The most serious loss that I and the regiment could have suffered befell just before we charged”. The statue, designed and created by Solon Borglum, was erected in Prescott in 1907. It was seen in the movie Billy Jack in the Korean martial art scene. The HDR image below was created from three hand-held bracketed photos. I used Photomatix to merge the photos, and then used Paintshop Photo Pro X3 and Topaz Adjust / DeNoise to post-process. It’s challenging to work with the dark sculpture against the lighter sky and snow, but hopefully I didn’t butcher this one too badly….I like it anyway! 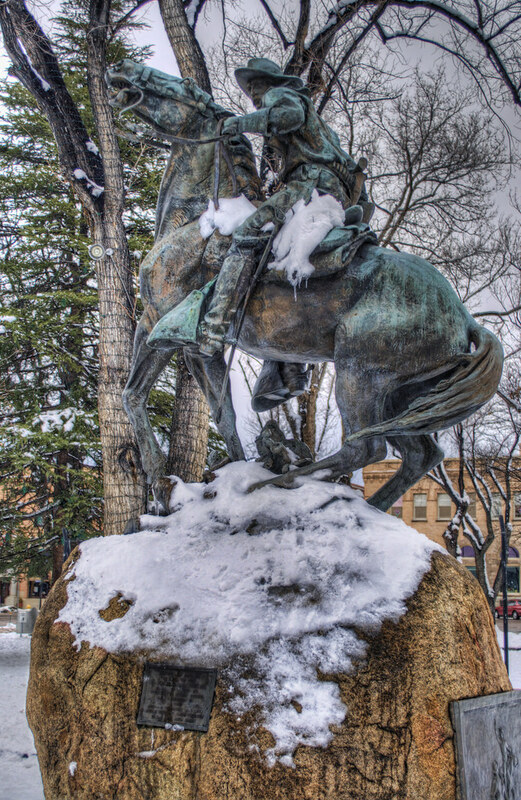 This entry was posted in Information, Processing, Shooting and tagged Arizona, AZ, bronze, Buckey O'Neill, camera, cowboy, D5000, HDR, Nikon, Paint Shop Pro, Photomatix, Prescott, Rough Rider, sculpture, snow, software, Topaz, tree, winter, Yavapai. Bookmark the permalink.